Almost noiseless in operation, these Flexible Clear PVC Swinging Doors can be opened with a light push of the hand or trolley, and will automatically close after entry. Being completely clear, they give an unrestricted view of oncoming traffic. With their dual-swing hinge, they have proven to be an asset in many applications such as keeping out drafts, dust and pests, while continuing to provide outstanding results in new applications using their safety, hygiene, temperature and acoustic isolation properties. Ideal in applications where the PVC Swing Doors are subjected to heavy duty traffic such as Fork Lifts, Pallet Trolleys etc, these doors will provide a low maintenance solution in an industrial traffic situation. For medium duty applications i.e. personnel traffic and trolleys etc, we recommend installing our aluminium framed Medium Duty Swing Doors. Click here to go to our Medium Duty Swing Door Page. 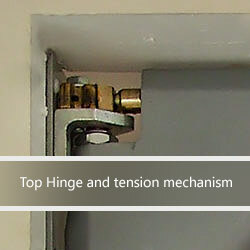 Automatic Closing – All doors have an adjustable torsion mechanism located in the head of the door frame, a tension tool is required for this adjustment. 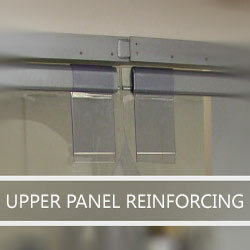 PVC Panels – Are 7mm in thickness for Heavy Duty Swing Doors. 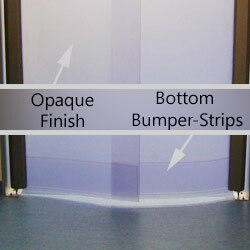 Bumper Strips – Additional strips of PVC located at the bottom of the panels are chemically welded to the panel for increased strength. Door Frames – Standard finish is Hammer Tone Grey enamel Paint, which is suitable for most applications. Lock Open – When required these unique plastic doors will remain open in the 90° position for rapid bulk loading convenience. Powder Coating – Provides a smooth finish and is available in a variety of colours for applications which require colour matching. Galvanized Frames – Is available for applications in Cold Rooms or other wet environments. Our Heavy Duty Swing Doors have an advanced adjustable Heavy Duty self-returning mechanism like no other on the market, consisting of brass components for smooth reliable operation. These doors are made to take the punishment of Pallet Trolleys and Fork Lifts. Door Frame – The door frame consists of press formed steel 2mm thick which are painted with enamel hammered finish for long life protection. PVC Panels – Our PVC Panels for Swing Doors are 5mm (Pedestrian only) or 7mm in thickness (For trolleys and fork lifts etc). Top Hinge – Is a galvanised cast steel plate 90mm wide x 90mm high that accommodates for 4x M8x16 socket screws. Bottom Hinge – Is a galvanised cast steel bearing housing located approximately 450mm from the floor. Mounting Plates – Are required if the doorway frame does not provide 6mm thick steel, to tap threads for the M8 x 16 socket screws. Features and Options – Click on the Features Tab Above to view features and options. 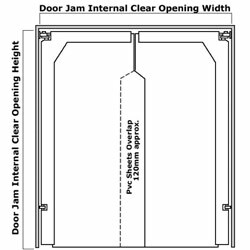 Due to the heavy-duty self-closing mechanism, door jambs must provide a strong structure. 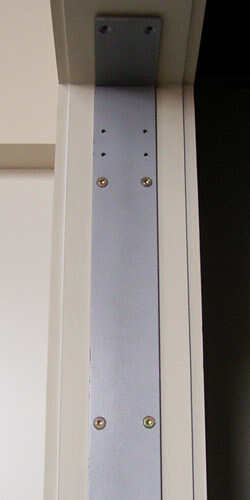 Door ways that do not provide 6mm thick steel to accommodate the M8x16 socket screws will require either Mounting Plates (90mm x 6mm steel flat bar). Door ways that do not provide adequate strength (Coldroom Panel or metal stud with gyprock et.) May require a steel RHS Box Sub-frame or similar surrounding the door way. Austcold Industries can provide these together with the doors. 6mm thick steel mounting plate. Check to see if the door opening is square. Note: If the door opening is not square you may need to pack out the hinges (Using the steel packers provided) to compensate. Mark out the fixing holes onto the door frame/jamb as per the template provided. The template must be square to the underside of the door frame/jamb. Note: If mounting plates have been supplied with the swing doors, the template is not required, as the mounting plates have been pre-drilled and tapped. Drill the door frame/jamb using a 6.8mm drill bit. Tap the holes using an 8mm x 1.25mm tap. Lift the swing door into position and, using a wedge, prop up the door. There should be a gap of approximately 6mm from the underside of the door frame/jamb to the top of the swing door. Fix off the base plate by using the 8mm socket head cap screws provided. Position the side-mounted lower hinge against the door frame/jamb and mark out the holes. Drill and tap as explained in steps 3 & 4. Ensure that the lower hinge is adjusted square to the door frame/jamb. Fix off the side-mounted lower hinge by using the 8mm socket head cap screws provided. To adjust the door, loosen bolt ‘A’ (14mm) slightly. Centre the door by adjusting the worm screws “B” on the rolling piece either left or right. This will align the centre of the door. Note: Re-tighten bolt “A” (14mm) securely after adjusting the rolling piece. All PVC swing doors are pre-tensioned before dispatch. If the door requires more or less tension, remove the PVC insert at the top end of the door frame. Insert the tension key into the spring tube (located inside the frame) and turn clockwise for more tension, or anti-clockwise for less. Note: Never unscrew the adjustment nut fully (anti-clockwise), as removing this nut will release the internal tensioning of the spring. The tension key is not supplied as standard; it can be purchased from Austcold Industries Pty. Ltd.
Lubrication: It is recommended that periodic greasing of the plunger, prism and lower hinge in undertaken approximately every 2 to 3 months, depending on the environment. Cleaning: The PVC panel can be cleaned with warm, soapy water and detergent, or, water under pressure, so long as the temperature does not exceed 40 degrees. Do NOT use solvents such as ketones, esters, cyclohexanol, benzenes, trichloroethylene and tetrahydrofuranes.